Choosing a roof color option for your property can be an exciting process, especially today, when you have more than enough options available in the market. It's important that you don't get lost in the sea of color choices. Also, keep in mind that the choice of a roof color can greatly affect the aesthetics, appearance and the general look and feel of your home. Finally, color choices can also contribute to the longevity of your roof structure. For instance, a color option such as Textr3d provides a refreshingly new and improved performance on any roof. This color option has been designed to offer dimensional depth to the surface, and can, therefore, diffuse and redirect light to provide a riveting look while reducing the appearance of oil-canning. It has also been designed offer a more durable surface that is resistant to scuffing, cracking, or scratching that is more common in low gloss or matte finishes. At South Bend metal Roofers in South Bend, Indiana we value our client, and this is why We provide them with a variety of roof color choices. 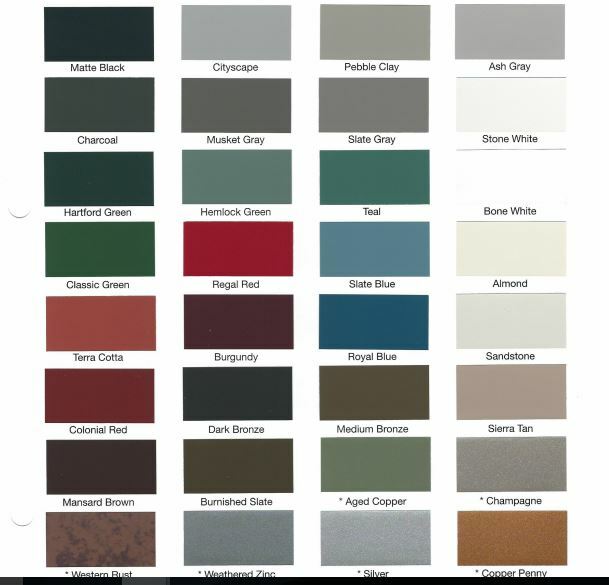 Our sample color choices can help the clients match their home color before they place they place their order for having their metal roofs installed. We are glad to provide contemporary color metal roofs for our clients, and we provide our installation, maintenance and repair services at budget-friendly prices. When you choose to install our aesthetic and colored metal roof,we offer you a long lasting guarantee, and this is because we only use the highest quality material-whether its metal, steel, or steel roofing, We know it will provide your property a lifetime of beauty and protection. At South Bend metal Roofers in South Bend, Indiana, We only use the best roofing color choices for our clients. To be more specific,we use Kynar 500,which is arobust paint that comes with a 35-year warranty. Each of our client gets a warrant for the metal applied to their property from the manufacturer. Keep in mind that the color sample represented on our website chart may not exactly match the actual material color. All colors should be verified using our actual material sample. Also, if you would like us to customize your roof color options, We the necessary skills and are pleased to tailor your roof according to your needs. ​The role of your property roof serves more than just protecting your premises; it's also a mirror to your home. It reflects what type of person you are. It also can improve the aesthetics of your home, especially if it's the color choice accentuates the overall structure.